A gay couple in Canada celebrating an anniversary asked for the "gayest cake ever," and an Ontario bakery delivered! The Supreme Court of the United States is currently deciding whether or not it will allow the case of Masterpiece Cakeshop, Ltd v. Colorado Civil Rights Commission to determine if bakers, based on their religious beliefs, can refuse to bake for LGBT people. 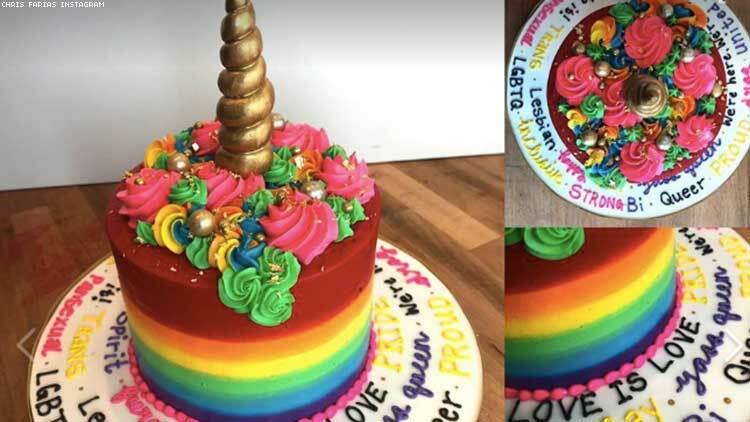 Meanwhile, a baker to the north in Hamilton, Ontario, who was tasked with making the “gayest cake ever” by a gay couple celebrating the one-year anniversary of their engagement, may have actually created the "gayest cake ever." Hamilton’s Cake and Loaf Bakery combined rainbows, pastels, rainbow sprinkles, empowering queer words, and a unicorn's horn to attempt to bake “the gayest cake ever” for Chris Farias and Jared Lenover celebration of their engagement, according to HuffPost. The bakery responded to Farias’s Instagram post with an equally uplifting post that included photos of the cake. As for the cake’s decorator, Quinn Pallister, making the perfect confection was personal as well as business considering she’s the child of two moms. "Seeing my moms being part of the LGBT community, it’s just really important to me that everybody feels included," Pallister told BuzzFeed. "I never got to make them a wedding cake, so this was like making something for everybody that’s part of the community." The Supreme Court heard arguments in the case of Masterpiece Cake Shop earlier this month. The roots of the case began in 2012 when Jack Phillips a baker based in Lakewood, Co., refused to make a wedding cake for David Mullins and Charlie Craig simply because they were gay. Phillips cited his religious beliefs as a cause for the discrimination. A Colorado judge determined in late 2013 that the baker had violated a state law that prohibits businesses from refusing service due to a person’s sexual orientation. Phillips appealed the decision, arguing that cake decorating is his "creative expression," and the case went on to wend its way through the courts until it made it to the highest in the land. The decision in the case is not expected to come down until spring of 2018.